October was all about the pumpkins. 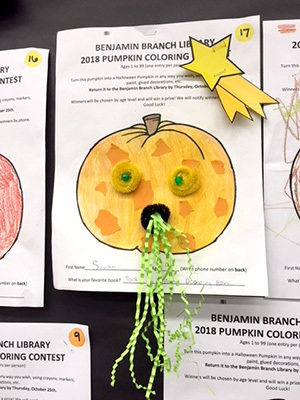 Thanks to everyone who entered our annual pumpkin coloring contest. Once again, we had some very colorful and creative entries. In fact, 9-year-old Sivan’s entry gave us all a chuckle. This fun, light aerobic workout will return to its regular Friday rotation at 11:15 a.m. The class includes dance steps, chair aerobics, toning with weights and bands and a cool down. While this free class is open to everyone, older adults will benefit from the movements that improve balance and stability. Please note, there will be no class on Nov. 23. Participants will learn how to create delicious and satisfying meals using all plant-based food products and ingredients. This hands-on culinary lab will give you an opportunity to practice making recipes, taste test new products and learn to create new healthy meals. All ages welcome. Tuesday, Nov. 13 at 6 p.m.
We will be closed on Nov. 12 in honor of Veterans Day. Thanks to all our veterans for your service! We will also have a change in schedule on Nov. 21, the day before Thanksgiving. Our hours this day will be 9:30 a.m. to 6 p.m. so we can get home and get our turkeys in the oven. Happy Thanksgiving to all. Oh, and we will be closed on Thanksgiving as well. Our monthly book club will be reading selections for Raymond Carver’s “Call Me if You Need Me.” Copies of the book are available for check out at the circulation desk. 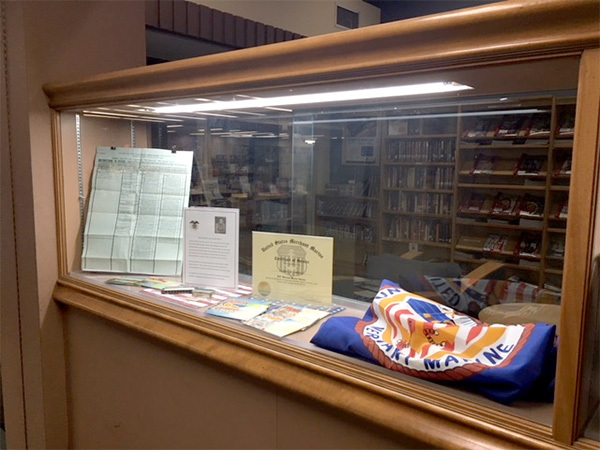 November’s book club will take place on Tuesday, Nov. 13 at 1 p.m.
Our very own Friend of the Library treasurer, Sheila Padgett, has graciously lent us some of her late father’s World War II memorabilia to display. Be sure to take a look at some of the souvenir postcards and keepsakes from the 1940s. In fact, thanks to this display, we know what wax vestas are. Join us November for Handmade @ the Library, holiday edition! We will be making bath bombs on Nov. 10 at 2 p.m. Space is limited, sign up online at sandiego.librarymarket.com. Upcoming programs take place on Nov. 24 and Dec. 8, both at 2 p.m., and registration for these events will open on Tuesday, Nov. 13. —Kathryn Johnson is managing librarian of the Allied Gardens/Benjamin Branch Library.